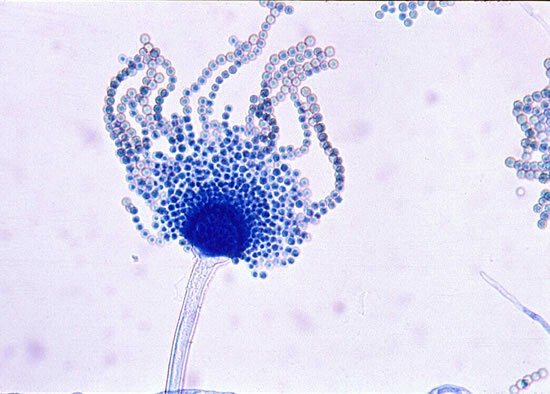 “Aspergillus flavus is an opportunistic pathogen of plants, animals, and humans.” You click on the link and here’s what you find. Under the right conditions, it will grow and produced aflatoxin in almost any stored crop seed1. Aflatoxicosis, illness from aflatoxin poisoning, can occur acutely or chronically. Acute poisoning may result in death and is caused by ingestion of high concentrations in only a few exposures; whereas, chronic poisoning results from a daily intake of low doses over a longer period2. Chronic aflatoxicosis causes decreased food consumption, stunted growth, immune suppression, and liver cancer2. Aflatoxin B1 is the most toxic and potent hepatocarcinogenic natural compound ever characterized; it is associated with hepatocellular carcinoma2,3. It is one of four major structurally related mycotoxins, which are secondary metabolites of fungi that are potentially harmful to humans and animals3. Okay so you have figured out that no, if you have in fact ingested this mycotoxin, you have not consumed enough to cause any effects to yourself. Phew! But what is this fungus anyway? 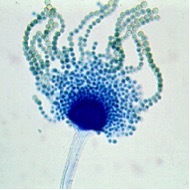 Aspergillus flavus produces numerous airborne conidia that are readily dispersed by air movements and insects3, spreading the potential contamination quickly throughout a vast area. The fungus overwinters as mycelium or as sclerotia, resistant structures that then germinate to produce more hyphae or produce conidia and further disperse into the air and soil3. The fungus grows best in dry, warm air, with an optimal temperature between 28 and 35°C, a climate that is common in most tropical countries just above the equator3,4. It spends most of its life as a saprophyte in the soil as an important nutrient recycler, breaking down plant and animal debris3. A. flavus is able to survive harsh conditions, from 12-48°C, allowing it to easily out-compete other organisms for soil or plant nutrients3. It thrives while other organisms fail to do so, therefore it has the potential to contaminate further soils and crops. Aflatoxins negatively impact food security due to their high toxicity and cause an estimated one billion dollars in economic loss2. Aflatoxin and other mycotoxins affect numerous foods, including stored and fermented foods since nutrient richness present in these foods stimulate aflatoxin synthesis4. Several staple agricultural crops are affected including rice, maize, peanut, and cottonseed, both before and after harvest2. Certain environmental conditions are favourable for fungal growth and biosynthesis of aflatoxin within the food. These conditions include slightly increased CO2 concentrations, interactions with temperature, availability of water, and are particularly favourable when the plant is under hydrous stress4. Insect damage is also associated with increased infection of plants preharvest while the plant is still growing2. Insect damage as well as excessive moisture from improper storage contribute greatly to postharvest contamination of seeds2. Production of aflatoxin has actually been suggested to be a fungal response to oxidative stress while also acting as a source of protection from it5. Agricultural practices are being put into practice to control aflatoxin production. Such practices include reducing plant stress, planting regionally adapted cultivars, using adequate fertilization especially nitrogen, limiting insect damage, irrigating when needed, and harvesting as soon as crops mature1. It has been shown however, that glutamine is the optimal nitrogen source, producing maximal aflatoxin B1 in A. flavus, albeit to a threshold6. By inhibiting the central regulator of cell growth in response to nitrogen, the glutamine inducing effect on aflatoxin B1 production, fungal growth of A. flavus, and its conidiation can be suppressed6. Corn infected with Aspergillus flavus. Public domain courtesy of United States Department of Agriculture. Peanuts infected with Aspergillus flavus. Public domain courtesy of United States Department of Agriculture. So that’s great! With all these practices we must have a solution we can implement to control the contamination by A. flavus so that we will no longer have such a great food loss. But how do we consistently reduce plant stress and limit insect damage in a sustainable and eco-friendly way? This is a very hot topic in our society at the moment. These practices can be costly and harmful to the environment, and do not necessarily control toxin production adequately. Not to worry, our amazing friends the microbes can be used to degrade aflatoxins in contaminated food after it has been harvested! Microbial degradation limits food and feed nutritional losses and is thus a very promising technique7. Numerous bacteria and various fungi, algae, and yeasts are able to degrade aflatoxin B1, mostly through the action of extracellular enzymes4,7. You wonder that since microbes have the ability to degrade aflatoxin, if plants contain a compound that may exhibit similar abilities. Plants do contain a plethora of nutrients. Scientists have discovered the use of antioxidants against A. flavus, more specifically phenolic antioxidants, to limit fungal growth and inhibit the biosynthesis of aflatoxin5,8. Essential oils of various aromatic plants are currently being investigated for their suitability as antifungal and antiaflatoxin compounds, and for their potential use as food preservatives9. Essential oils are commonly used in food and beverage consumption (and maybe you frequently associate them with aromatherapy and candles). These essential oils contain phenolic antioxidants that target the plasma membrane, disrupting the permeability, and cause mitochondrial dysfunction through the accumulation of reactive oxygen species within A. flavus9,10,11. Marjoram, coriander, Ham-ex-Smith, myrrh, ylang ylang, dill, and turmeric are just a few essential oils shown to exhibit these antifungal properties9,10,11! Essential oils are plant-based, biodegradable in nature, and eco-friendly, displaying advantages over synthetic preservatives for food9. Having plant-based preservatives also reduces the possibility of the fungus developing resistance9. Plants saving plants? How cool! Plants are safer and healthier for the environment over synthetic derivatives, providing not only ourselves nutrients but organisms in the environment as well. But wait, you realize antioxidants are what doctors tell us to eat all the time, don’t they? These are the compounds that are in green tea and blueberries that are really good for us. Who knew they would be so promising as an antifungal agent! Well then, you have discovered lots of information about Aspergillus flavus, its aflatoxin B1 biosynthesis, and the effects it has on human health and agriculture. You can educate people on the importance of storing their food properly to prevent contamination and save hundreds of crops each year. Imagine all the things that can be done with antioxidants! What amazing things science teaches us and what a learning experience it has been for you! Now it is time for you to carry on in your adventure. This work by Danielle Sidsworth is licensed under a Creative Commons CC-BY Attribution 4.0 International License.